Zillow, the leading real estate and rental marketplace, has released its predictions for 2017’s top ten hottest real estate markets in the United States. Number one on the list is none other than our very own Nashville, Tennessee! To determine this, Zillow focused on low unemployment rates, rising home values, and a strong growth income. Nashville’s increase in healthcare employment brought it to the top of the list along with a forecasted 4% unemployment rate, 4.3% appreciation on home values, and an income growth of 1.1%! Knoxville, Tennessee also made an appearance at number 7 on the list with the remaining cities concentrated in the West. Portland, at number 6, was reported to have the strongest home growth value, at 15%, in 2016 among 100 metros in the United States. Housing experts foresee that Portland will continue to excel in value along with Seattle and Denver. Utah holds three spots on the top ten with Provo at 3, Salt Lake City at 5, and Ogden coming in at 8. Although Sacramento, California comes in last, it boasts the title of most affordable large metro in the state with 58% cheaper housing than the Bay Area and a projected 5% increase in homes for 2017. 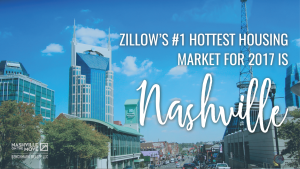 Zillow’s Chief Economist Dr. Svenja Gudell says that mid-sized cities, like Nashville, are “desirable places to live, with good employment opportunities and steady economic growth. The growth and demand for housing will drive up home prices in 2017, and these hot markets are experiencing change as more people discover them.” To find out more about Zillow’s top ten list, click here.